My history teacher said that the USA has offered aid to every other sovereign nation that has existed the same time at us. He defines aid as being humanitarian, economical, or militaristic. Is this claim true? I know it hard to prove a negative, but has there ever been a sovereign nation that the USA has never aided? Note: I thought of the Confederacy, but apparently it was not a sovereign nation. I also think it's important to understand what exactly is "aid" between governments and this isn't exactly what you would call "helping your friend". However, non-government organization watch groups have noted that as much as 40% of aid to Afghanistan has found its way back to donor countries through awarding contracts at inflated costs. In situations where the U.S. is hostile to the government of a country, USAID may be asked to undertake programs that the government would not accept and thus to operate without the government's knowledge. This might include USAID support for opposition political movements that seek to remove the government. 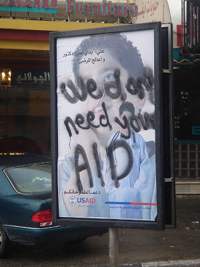 Such "political aid" is criticized by some as being incompatible with USAID's role as an assistance or cooperation agency and as exposing USAID staff worldwide to the suspicion of being covertly engaged in subversion. It is a bit naïve to think that large powerful governments can allow themselves to be altruistic. Usually their job is to work for profit, economical or political. I'm sure that in the case of disaster relief, the US offers any aid that they can as a matter of routine. Often this involves military units, since they have the vehicles and training to go into areas where the infrastructure has been destroyed, and they are able to move at a moment's notice to remote parts of the world. Not the answer you're looking for? Browse other questions tagged united-states international-relations political-economy nation-states or ask your own question. How has enforcement of the USA-Mexico border changed over time? Has the USA ever taken unilateral military action? Was there really a labor shortage in the USA until 1970? When did GB acknowledge the USA as sovereign state? What actions did the USA take in 2003 to prevent other countries from coming to Iraq's aid?